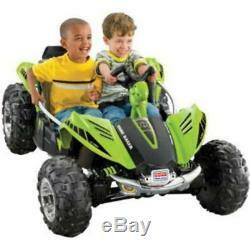 Fisher-Price Power Wheels Dune Racer 12-Volt Battery-Powered Ride-on 4 wheeler. The Fisher-Price Power Wheels Dune Racer 12-Volt Battery-Powered Ride-On in Green offers kids hours of imaginative driving entertainment. Seating up to two little dune racers, the Power Wheels Dune Racer features a realistic open cockpit design that adds to the fun. This rugged Fisher-Price Power Wheels ride-on boasts large off-road tires and provides a maximum speed of 5 mph. It has two forward speeds and one reverse speed. Not ready for a higher speed? Parents can easily lock out the high-speed setting as a safety measure for beginners. The power lock brakes add to the safety features of this dune racer ride-on. 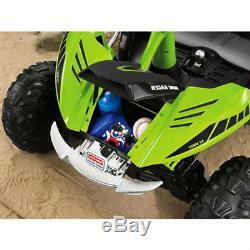 The battery-powered riding toy comes with a 12-volt battery and charger. Once it is completely charged, the vehicle can run for 50 minutes at a time. It's recommended for children above 3 years old. 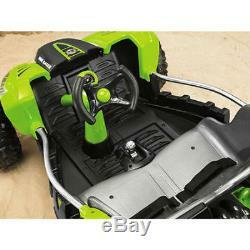 Fisher-Price Power Wheels Dune Racer 12-Volt Battery-Powered Ride-on, Green. 2 forward speeds and 1 reverse speed. Dune racer ride-on maximum speed: 5 mph. High-speed lock out for beginners. Fisher-Price Power Wheels ride-on requires 14-18 hours to completely charge. Battery delivers 50 minutes of continuous driving. 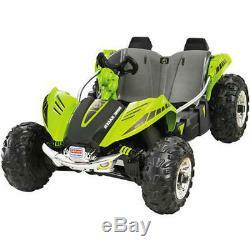 Battery-powered Dune Racer includes 12V battery and charger. Dimensions: 53"L x 32"W x 24H. Maximum weight capacity: 130 lbs. Fisher-Price Power Wheels Dune Racer 12-Volt Battery-Powered Ride-On in Green requires adult assembly; instructions included. The item "Fisher-Price Power Wheels Dune Racer 12-Volt Battery-Powered Ride-on 4 wheeler" is in sale since Wednesday, July 29, 2015. This item is in the category "Toys & Hobbies\Outdoor Toys & Structures\Ride-Ons & Tricycles\1970-Now". The seller is "kellysdiscounts" and is located in Nationwide US. This item can be shipped to United States.